Smarter search that delivers the right products drives higher revenues. It’s proven, benchmarked and now, guaranteed. It’s also about delivering a shopping experience that delights your customers and encourages them to buy from you vs. your competition. Search is a problem in the eyes of most shoppers when they are not finding what they want quickly or easily, as all eCommerce shoppers have experienced. Prior to signing with EasyAsk, a premier footwear and apparel retailer with $3bn/annual sales understood this challenge and explored potential solutions. They looked at other high volume retailers, including The North Face, Journey’s and TrueValue who were getting outstanding search results. Having faced similar challenges, these companies all chose EasyAsk. 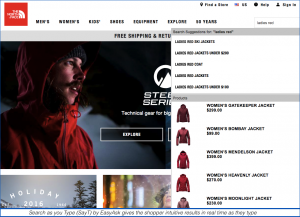 The North Face selected EasyAsk to replace SOLR, the default search engine in IBM WebSphere and saw a revenue boost of 23% after the switch within 90 days. An essential requirement was a search solution that delivered intelligent, semantic, Natural Language search capabilities, so that the search engine not only understood the content of what the shopper asked for, but also the intent. Unlike SOLR, EasyAsk offers powerful merchandising tools that are intuitive, easy-to-use and maintained by business users instead of programmers. This allows for changes to be implemented on the fly, which results in up-to-date merchandising to satisfy the shopper’s immediate needs. EasyAsk’s advanced semantic engine also provides intelligent, intuitive Search-as-you-Type, synonyms and analytics allowing the eCommerce team to spend their time on search instead of system tweaks – resulting in bigger gains and more immediate payoff. Bottom Line – 71% revenue boost over 5 months meant that this retailer achieved EasyAsk’s ROI dramatically faster than initially budgeted. The rest is pure profit. We will contractually guarantee that EasyAsk will drive at least 20% more revenue from search. We will take a baseline benchmark measuring revenue, conversion rate and average transactions on your existing search engine. We will work with you to deploy and implement EasyAsk’s eCommerce suite to provide you with advanced Natural Language semantic search and merchandising. Within 90 days of implementation, we will perform a new benchmark that measures revenue, conversion rate and average transactions and compare them with the original baseline. EasyAsk will contractually guarantee to drive at least 20% more revenue. Request a Demo of EasyAsk so we can show you how we can do the same for you. That’s it! With no risk to you, one call to EasyAsk can get you started on the road to higher eCommerce revenues.